The new Unique 2 is a versatile 3-way addition to your life! At 2.2 cu/ft, it can operate on three different power sources- propane, 12 volt for the truck, or 110 volt. Super efficient, it will operate at -16C/+3.2F in a +25C/77F ambient under propane/110 volt. 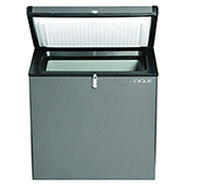 Whether you want additional freezer capacity at the cottage (can use as a fridge on gas), or to transport frozen food to camp on 12V, there are all kinds of applications for this appliance. All at a great price! CSA Certified - Unique understands that certification is the badge of quality. Non certified appliances may void your cottage/house insurance, and are illegal in Canada. 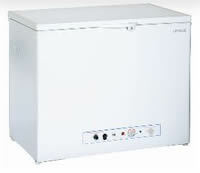 This particular product is certified under the portable gas-fired camping refrigerator standard. Energy Sipper - The fridge only uses approx 0.7 lbs of propane per day...Think about it - a 20 lb LPG tank would last a month! Per the AINSI standard, this refrigerator is intended for use both indoors in adequately ventilated structures, and outdoors. Please refer to relevant provincial/state codes.